In the Orthodox Jewish religion a woman can’t get a divorce without the husband’s permission and is given a gett in her hand from him that basically says “You are hereby permitted to all men.” This in effect says she is no longer a married woman and returns to the wife all the legal rights that a husband is responsible for in their marriage. The divorce decree is only obtainable in Israel from a rabbinical court. In a so called ‘modern’ democratic country it may surprise many that in a marriage a woman has no equality. “Gett: The Trial of Viviane Amsalem”, the Israel nominated Oscar contender for Best Foreign Film, is the third, and a stand alone, in a trilogy of this couple. This is a trial with Vivianne as the only woman, her lawyer, her husband and his lawyer who happens to be his brother and the three rabbi judges. Over a period of 5 years we follow her fight for that important piece of paper for her to get on with her life. As the trial progresses, or doesn’t, we learn about the wife Viviane and husband Elisha, their 4 children, their marriage and why she wants a divorce and he won’t give her one. It isn’t until the middle of the movie that her sister and sister-in-law are presented bringing some fireworks to the screen which takes place mainly in a square windowless room with two tables, 4 chairs and the rabbis raised up on a dais, with another table brought in for the witnesses. “Gett: The Trial of Viviane Amsalem” was written and directed by the sister and brother team Ronit and Shlomi Elkabetz with Ronit playing Viviane and Shlomi, her husband Elisha. With the exception of 2 impressive outbursts Ronit holds the screen with her very expressive face while Shlomi has a quiet power as he tries to explain himself. Both Menashe Noy, as her lawyer, and Sasson Gabay, as his, support the two impressively. 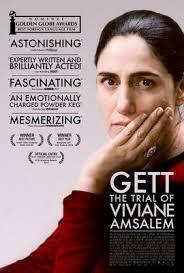 “Gett: The Trial of Viviane Amsalem” tackles an intriguing subject that not many people know about but moves too slowly to be as effective as it could and should be.